Colleen O’Rourke is the most successful matchmaker in Manningsport, New York, with fifteen matches to her credit. She has a gift for recognizing people who will work as a couple, and her many namesakes are testament to the appreciation her friends feel. But like a physician unable to use her healing skills to heal herself, Colleen’s matchmaking ability does not include finding the man with whom she can share an HEA. At thirty-one, she has flirting down to an art form, and she enjoys an occasional fling with a man no more interested than she is in commitment. But she limits her emotional investment to her love for Connor, her twin brother and co-owner of Manningsport’s only year-round bar, and a tight circle of friends that includes the Holland sisters (The Best Man, The Perfect Match). A decade earlier, her first love, which she believed would last forever, ended with her lover married to someone else and Colleen patching together the pieces of her broken heart. She has had no desire to risk her heart again, a determination reinforced by a lifetime with a cheating father and a mother unable to move on with her life after divorce. Lucas Campbell never planned to return to Manningsport, but a call for help from his Uncle Joe, who has stage IV lung cancer, forces him to change his plans. Joe was there when Lucas needed him as a teenager after a series of family crises, and not even Lucas’s dislike for his gold-digger aunt or his unresolved feelings about Colleen O’Rourke will keep him from doing all he can to make Joe’s last days easier. Although he is not returning for Colleen and hasn’t even made any attempt to contact her in the two years since his divorce, once he sees her again, he knows things are not finished between them. Colleen may be unable to control the way her body responds to Lucas, but she is determined to control what she does about that response. Avoiding Lucas is clearly her best option, even if he is better-looking and sexier than the younger Lucas who captured her heart. But avoiding him improves impossible as the two find themselves in one another’s company repeatedly. The impossible happens as they forgive one another and themselves and begin again. But just when their happily-ever-after seems within their grasp, a secret is revealed that has history repeating itself. Can these two move past the mistakes of the past to find the trust they need to claim the happiness and love they deserve? Kristan Higgins takes her readers back to New York wine country for the third novel in her Blue Heron series. As with the other books, Higgins adds a full cast of characters to the story, showing readers the family backgrounds that have made Colleen and Lucas the complicated people they are. Readers who prefer their romances to focus solidly on the hero and heroine’s relationship and view anything beyond minimal background as a distraction may be less than fully happy with this story, but those who like their romances rich in contexts (and I am in this company) will be delighted to see that the relationships in this book include parent-child, siblings, extended family, and friendship as well as romance. In other words, Higgins gives readers the multiple relationships that likely are reflected in their own lives. Colleen and Lucas are fully dimensional characters whose actions and reactions readers will understand even if they sometimes wish they behaved differently. Higgins is also among the very best at mixing the humorous and the poignant. She does this wonderfully well in the scene where Colleen sees Lucas in her bar after a ten year separation. Colleen’s comments had me chuckling at the same time her heartbreak left me teary. The broadest humor is reserved for the scenes involving Colleen’s matchmaking for the inept Paulie Petrosinsky and Lucas’s handsome, somewhat dense cousin Bryce. I laughed even as I cringed in sympathy with Paulie. Higgins is known for her humor, but she is also expert at creating substantive, interesting characters who engage readers emotionally. Even the characters who appear fleetingly have individual quirks and a real presence. 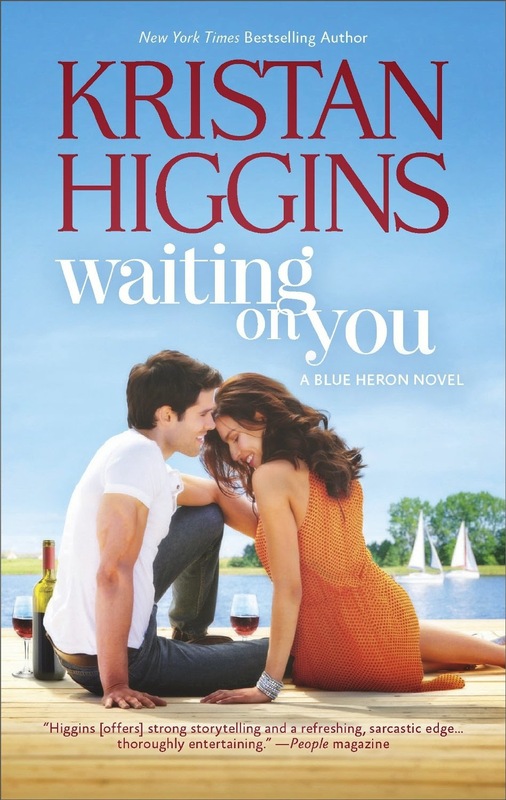 Higgins has been a winner since her first book, but she has reached a new level of excellence in the Blue Heron books. Waiting on You doesn’t quite reach the all-time-best-romances level of The Best Man, but it is definitely a recommended read. Now I’m ready for Jack’s story and Connor’s and Jess’s and the stories of whatever other characters Kristan Higgins has in store for her readers. I am so looking forward to this book! Thank you for the excellent & thorough review! I have been loving this series! I read mostly historicals, but appreciate good contemporary romance. I have heard nothing but good things about Kristan Higgins' books. I have a couple in my TBR mountain I have been trying to get to. This sounds like a series I will like. I have never been one to like strictly relationship stories. They tend to be interchangeable with any setting or time period, and sometimes characters. People are products of their surroundings and relationships. To me, these are needed to flesh out a story and make the characters and relationships relevant.